The Auspice of Auspices is one of the ten Auspicious Asterisms (as-su’ud). The Arabic term indicates good fortune or something that is auspicious, especially a star. The Auspicious Asterisms are all pairs of otherwise unremarkable stars, except for one that is comprised of four stars. The Auspice of Auspices was most sought after for good fortune among the ten Auspicious Asterisms, thus lending to its name. 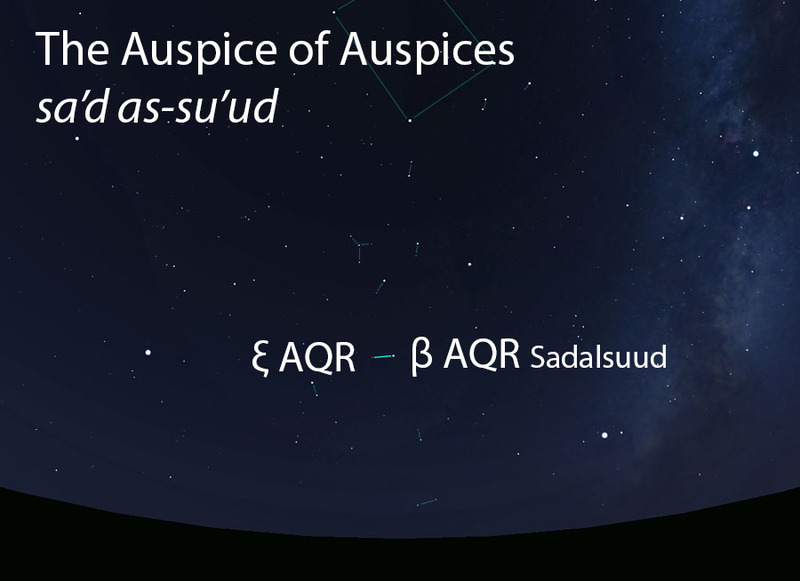 Ibn Qutuayba said the Auspice of Auspices was an asterism containing three stars, one bright and two dim, but most other accounts mentioned only two stars, one bright and one dim. 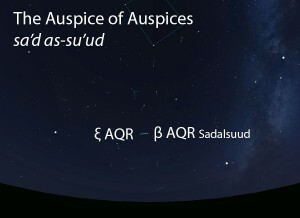 The Auspice of Auspices (sa’d as-su’ud) as it appears in the west about 45 minutes before sunrise in early August. Sky simulations made with Stellarium. In early listings of the lunar stations, the Auspice of Auspices is the 26th station of the year. This was later changed to the 24th lunar station after the stations were adjusted to begin with the vernal equinox. The Auspice of Auspices is part of the Auspicious Asterisms (as-su’ud, السعود) folkloric celestial complex.